Owner of the Pittsburgh Steelers, Dan Rooney, passed away on April 13, 2017. He was the son of Steelers founder Art Rooney. 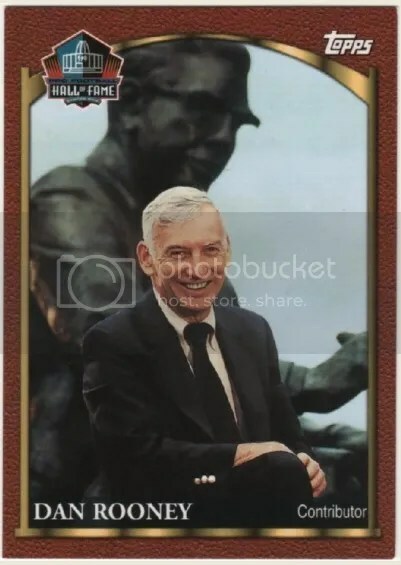 Owners typically don’t have that many cards, but Dan Rooney had a few. In honor of Dan Rooney’s passing, Steelers staff wore the above pin during the 2017 NFL Draft. I don’t have a problem with the Steelers wanting to pay tribute to Dan Rooney with this pin. From a collecting standpoint it could easily cause some problems though. With Dan Rooney passing away only two weeks prior to the start of the draft, there probably wasn’t enough time to design a new tribute pin from scratch. Instead they had to improvise with what they had. 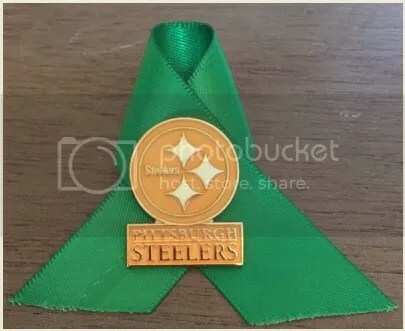 The Steelers simply took one of their misty gold lapel pins and pinned it to a green ribbon. Does anyone else see a potential problem here? What stops someone from buying a misty gold lapel pin for $4.95 and pinning it to easily accessible green ribbon which can be found at any craft store? The answer is nothing. Anyone could do that while attempting to spin a tale that it came from a Steelers staff member during the draft. The odds of an authentic one showing up for sale are slim. I highly doubt a large amount were put together. It would be in poor taste if someone from the Steelers did try and make money off of it. But it has been known to happen before. I can imagine an authentic pin would fetch quite a bit more than $5. The only way I’d trust that one of these Dan Rooney tribute pins is authentic is if I received one directly from a Steelers staff member. Otherwise you’d never know.